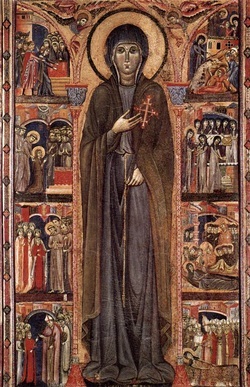 Clare was the daughter of a wealthy aristocratic family, but when she heard Francis preach, she determined to give her riches to the poor and to live a simple, austere life like Francis and his brothers, the men who had come to join him. She fled her family home during the night of Palm Sunday, 1212. This angered her family, who wanted her to make a brilliant marriage and to live the life of a great lady. They tried to make her return, but her mind was made up and she never wavered in her resolve. Francis found a home for Clare and her sister, Agnes, at the little church he had rebuilt. It was called San Damiano and was a short distance outside the walls of Assisi. Soon other women came to join her, including another sister and their mother. This picture is a very ancient depiction of Clare with all these events from her life illustrated around her.